Gaffers Tape | Large Selection of Colors and Sizes. 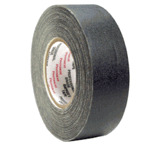 A Gaffers Tape is a strong cloth backed, vinyl coated tape and is a very useful tool used on film & theater sets for securing cables, wires, lighting, signs, props, microphones, bounce cards and more...Gaffer Tape to the rescue to solve more problems than any other tool. Also known as Gaff Tape. Pro tape is available in many colors from black to orange and fluorescent. Need just a little? Check out Micro Gaffer.